2 for 4—that is at Atkinsons’ Market in Ketchum, ID. I bought 2 delicious large avocados for $4. They come from Mexico and truly are so tasty and sweet, it’s hard to believe that they arrived here in that condition. YUM!! So, here’s a new twist to the ole’ guacamole and I think that it’s really good to eat with chips, or as a veggie wrap or with fish tacos. 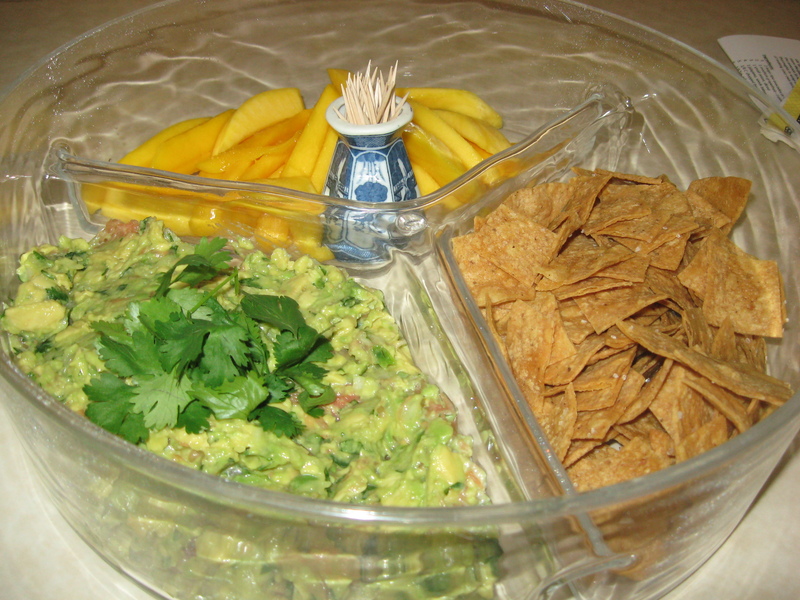 You can store the guacamole in the refrigerator for several days but here’s a tip: forget the old tradition of putting the pit in the avocado to keep it from turning brown. What makes the avocado turn is oxygen (air). So, if you wrap it thoroughly in wrap or in a container so that NO AIR can reach it, it’ll stay green. As well, I’ve included an easy way of making your own tortilla chips. Buenos apetito!!! I processed the onion and jalapeno into dice chop. But you can hand dice as well. Cut the grapefruit crosswise; serrate and cut out and drop the individual sections over the bowl—so as to catch the juice as well. Remove whatever seeds fall in. Cut the avocados in half, length wise; remove the pits; remove the flesh and put in bowl. You can do this with a spoon but I cut the flesh criss-cross wise and scoop it out that way. Add the chopped cilantro and salt. Mash it all with a potato masher or a fork. Serve it immediately or store in refrigerator till ready to serve. I think that it gets better when refrigerated for a bit. Brush BOTH sides of the tortillas with the oil. Stack the tortillas and cut the pile into sixths or whatever size you wish for your chips. Spread the chips in one layer out on parchment lined cookie sheets and season with salt to taste. Bake until golden brown and crisp for 12-15 minutes. Rotate the sheets half way through this time period. Place on a paper towel to drain and then store in a paper bag. You can also bake the chips without any oil. They just might not be quite as tasty, but certainly will contain fewer calories. And of course, you can go the full route, and deep fry them.